In 1939 a cry for help went out across the Commonwealth for able-bodied men to join in the fight for freedom against the Nazi enemy, write Stephen Peters and Frank Smart. Halfway across the world, in New Zealand, this appeal met with a positive response from men who rallied to the aid of the Mother Country in her hour of need. Nineteen-year-old New Zealander Wilfred Henry Burnham, known as “Bunny” by his friends and family, answered the call to arms and volunteered to enlist in the Royal New Zealand Air Force. Eventually, 52,000 young New Zealanders would join the RNZAF and be paid £150 per annum. Bunny lived at home (409 Lascelles Street, St Leonards) with his parents and younger sister in the Hawkes Bay area on North Island. His parents had married and settled in New Zealand immediately after the Great War. His father had previously emigrated from Sunderland along with a number of his brothers and sisters prior to the Great War, and all had established themselves and raised families in their new homeland. The family had also survived the devastating earthquake that hit the Hawkes Bay area in 1931. Bunny worked as a shop assistant after leaving school and ever since his Boy Scout days had always been interested in building and flying model aeroplanes. Now, at the tender age of 19, he had the chance to fulfil his boyhood dream of becoming a pilot. 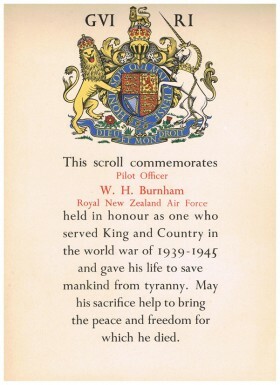 He would have been excited and enthusiastic at the prospect of joining the Royal New Zealand Air Force and his parents would have been so proud of him. His father and uncle had served in the New Zealand contingent of the BMEF stationed in Alexandria, Egypt during the Great War, so service to one’s country and King came naturally to the menfolk of the family. After enlisting on the Empire Air Training programme, young Bunny became a Sergeant Observer Navigator and he and his comrades made the voyage to Vancouver on board the MV Aorangi to receive further training in Canada. The name of the ship is Maori for “cloud piercer” – how apt! How exciting it must have been for him to embark on a three-week voyage on board a luxury liner via Fiji and Hawaii before arriving in British Columbia just prior to Christmas 1940. He was one of five New Zealanders on Training Course 27 between May 12 and June 21, 1941; firstly at No 4 Air Observer School in London. Ontario and then at No 1 Bombing and Gunnery School based in Jarvis, Ontario. He gained his “Wings” on June 21, 1941 and became a Pilot Officer. Bunny was next stationed in England where he was attached to 12 (RAF) Squadron Bomber Command based at RAF Binbrook in Lincolnshire. He found himself flying and crewing Wellington bombers that were engaged in regular bombing raids over Germany and northern Europe. Wellington bombers were known by the airmen as the “Wimpy” (after J. Wellington Wimpy, a character in the Popeye cartoons) or the “Flying Cigar”. They were built by Vickers-Armstrong and designed by Rex Pierson and employed a linen-covered geodesic air-frame devised by Sir Neville Barnes Wallis (of Dambusters fame). Bunny’s penultimate operation took place on the evening of November 25, 1941 with a take-off time of 1700 hrs in Wellington II bomber N8402. The Pilot was Pilot Officer Goodman and seven 500lb bombs were dropped on Cherbourg. He clocked up a total of 234 flying hours in his short career. His log book entries indicate many training flights with Sgt Doug Butterworth as Pilot, so a strong bond of friendship must have developed between the pair. Bunny was now based less than 200 miles away from Sunderland where the extensive Burnham family had its roots and where his grandfather (who died in December 1940) and a number of uncles, aunts and cousins still lived. No doubt Bunny visited his relatives during brief periods of leave and would proudly wear his RNZAF uniform. His personal diary entries for the period immediately after Christmas 1941 reveal his daily life and exploits, including a Boxing Day party where £91 was spent on drinks followed by lots of thick heads the next morning! The entry for New Year’s Eve records “Here 10 weeks today. Leave 5 weeks January 21st????”. Bunny was clearly looking forward to having some time off early in 1942 and only two days before his final flight he underlined “Leave on 23rd”. His final diary entry for Thursday January 8, 1942 reports: “Weather fair. Going to Cherbourg at 4.30 AM tomorrow. Telegram from Jones u/s starboard engine”. The Jones referred to may be Bunny’s friend Flying Officer Owen Kenyon Jones of the RNZAF, who died on June 12, 1943, or another friend, Sgt Russell Roy Alwyn Jones from Napier, New Zealand, assigned to 207 Sqn and with whom Bunny had trained in Canada. Wellington Mk II bomber W5356 was a twin-engined warplane and this version was powered by two Rolls Royce Merlin X 1130 h.p. V-12 supercharged piston engines and would have carried two tons of bombs. The plane had a crew of six: the pilot, Sgt Doug Butterworth (aged 20, from Rochdale), Sgt Brian Franklin (aged 21, from Gloucester), Sgt Charles Morrey (aged 20, from Barnsley); two Canadians, Sgt Bud Cable (aged 28) and Pilot Officer Bill Breck (aged 19); and finally, Pilot Officer Bunny Burnham, aged 21. Bunny’s log book indicates that the aircraft took off from RAF Binbrook at 0415 hrs on the morning of Friday January 9, 1942. Their mission was to bomb enemy defences and ships in Cherbourg. 31 aircraft were engaged on the bombing raid, with four being lost in action over France. Bunny’s plane returned to England but fell victim to a glycol coolant leak on the port engine, which eventually seized up in the intense cold of a very bleak winter’s morning. The aircraft limped back over central England and headed for RAF Wythall, perhaps mistakenly thinking it had an airfield. Unfortunately, it was the home of No 6 Barrage Balloon Command Centre and had no runway. The base did have elementary radio equipment and would have been in contact with the stricken aircraft. Unable to land, the brave pilot steered his plane past RAF Wythall and, after passing under high voltage overhead cables, the plane crash-landed in a field where one wing hit an oak tree, swinging the plane round and breaking its back before bursting into flames. The lack of one working engine would have meant that there was more high-octane aviation fuel left in the tanks and, once ignited, this would have destroyed the fabric-covered plane in a short time. Ten-year old schoolboy John Nash, living at Highfield Farm, witnessed the crash and ran to the scene with many others. Even now, at the age of 82, he still recalls the tragic event and the host of sightseers who came to the scene before the wreckage was finally cleared some few weeks later. Bud Cable and Bill Breck, the two Canadians, were not badly injured and were able to drag their four colleagues from the wreckage, aided by local people and men from the RAF base. The three English crewmen were dead, while Bunny Burnham sustained horrific injuries and burns and died two days later in Hollymoor Hospital, a military hospital in South Birmingham. We shall never know why W5356 did not attempt to land at RAF Pershore, 20 miles to the south, or at RAF Honiley, just 10 miles away to the east. Fate dictated that the crew would find themselves over the only RAF base that did not have a runway. But for hitting the oak tree, the crew may have survived. We shall never know. Bunny survived two days before succumbing to his injuries and died at 5.15pm on Sunday January 11, 1942. His fallen comrades were buried in their respective home towns but Bunny was laid to rest in Sunderland in the family grave, next to his grandfather. His uncle, Captain Norman Burnham R N, arranged his funeral. The announcement of his death and details of his funeral appeared in the Sunderland Daily Echo & Shipping Gazette dated Tuesday January 13, 1942 and the interment took place on the following Thursday, January 15. Both surviving Canadian airmen went on to achieve distinctions within the Air Force. Bill Breck rose to the rank of Wing Commander and later pursued an academic career. Bud Cable received the Distinguished Flying Medal in 1944 and then became a successful businessman – and many years later he chanced to meet some of the very Wythall people who had rescued him when they happened to visit his part of Canada! What would Bunny have achieved had he survived? We shall never know. He simply remains forever a 21-year-old New Zealander who made the ultimate sacrifice. Stephen Peters and Frank Smart are currently trying to get a road named after Bunny in a forthcoming housing development in Wythall. 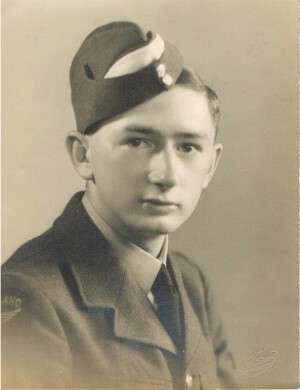 “The three British airmen who died in the crash have already been commemorated in road names on the Selsdon Close housing estate in South Wythall, but Bunny, who also gave his life for our country, has been ignored,” they point out. After the authors sent their request to Miller Homes, which has planning permission to build the houses, the developers told us that several ideas for road names honouring Bunny have been submitted to Bromsgrove District Council for consideration. “We will try our utmost to get the Council to implement the names on the Bleakhouse Farm development,” said Design Manager Luke Beaumont.